Poor House Brewing Co. & Supply, A New Brewery Coming to 30th St? 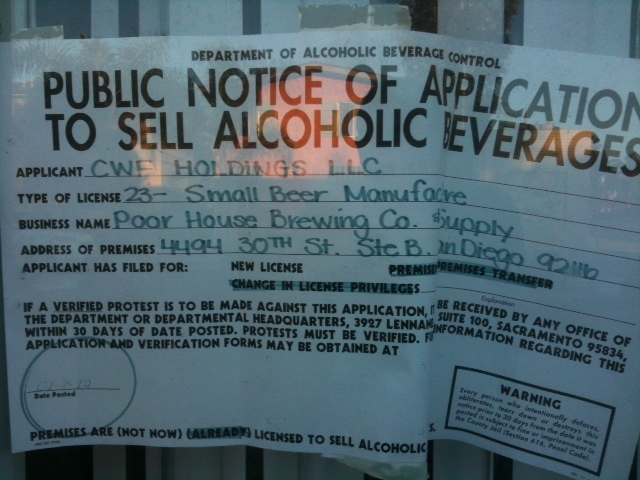 Reader David Hess (@AudacityOfHops on Twitter) sent along this photo of a company called Poor House Brewing Co. & Supply applying for a type 23 Small Business Manufacturer license at 4494 30th St Suite B about halfway between El Cajon Blvd and Adams Ave.
On the pending ABC License a “Christopher William Finch” is listed as a Managing Member of the new business. While I haven’t been able to confirm that this is the same person, Christopher Finch was one of the founders of the now defunct Firehouse Brewing Company in Mission Valley. In February 2011 UT San Diego’s Peter Rowe reported on a change in leadership at Firehouse, that Finch had been replaced as President and Board Chairman. Two months later in April I reported that Firehouse Brewing had filed for Chapter 7 bankruptcy and shortly after that their assets were sold at auction. If anyone has any more info on Poor House Brewing Co. & Supply or knows if this is the same Christopher Finch that co-founded Firehouse Brewing please leave a comment below or send me an email, I’d love to hear more. Update: The now expired ABC License for Firehouse Brewing Company also lists “Christoper William Finch,” still not confirmation that this is the same person but seems more likely.